21% is better than 12%. Surely, you must be joking! Is that really ever true? Yes, in case the 12% rate is being offered as Flat Rate to you whereas the 21% interest rate has been offered at a Reducing Balance calculation. If the reason is not clear to you, please read on. 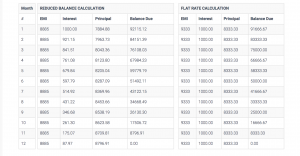 A Flat Rate is the same as Simple Rate of Interest that were all probably taught in grade 4 in Maths class. As an example, if you borrow 100,000 for 1 year at 12% then in total you pay back 12,000 as interest apart from the 100,000 principal amount. Okay, but what is Reducing Balance Rate of Interest? Reducing Balance rate is one where after every EMI that is repaid by the borrower, the remaining principal amount is considered for the interest calculation thus reducing the EMI’s Interest portion rather than considering the initial borrowed /principal amount. The Reducing Balance can itself be calculated in many ways like Reducing Balance every month, every day etc. For your reference, we have built a Simple / Flat vs Reduced Balance Calculator that you can play around with to see the difference. This is based on Monthly Reducing Balance calculations. “In case we calculate the EMI for Reducing Balance Rate for 100,000 for 1 year at 12%, your total interest would be only 6,613. Here is a sample shown from the Simple / Flat vs Reduced Balance Calculator to highlight the difference for every month. Okay, but how come 21% is better than 12%? Let’s continue with the example we took above. If you take 100,000 a 21% interest calculated on a Reducing Balance basis for 1 year, your net outgo of Total Interest paid would be 11,737. Hey, but what about my existing Home Loan? Most of us have taken a Home Loan. The good news is most of the Home Loans are already offered by big banks like SBI at a Reducing Balance calculations. What about Car and Vehicle Loans, Personal Loans? 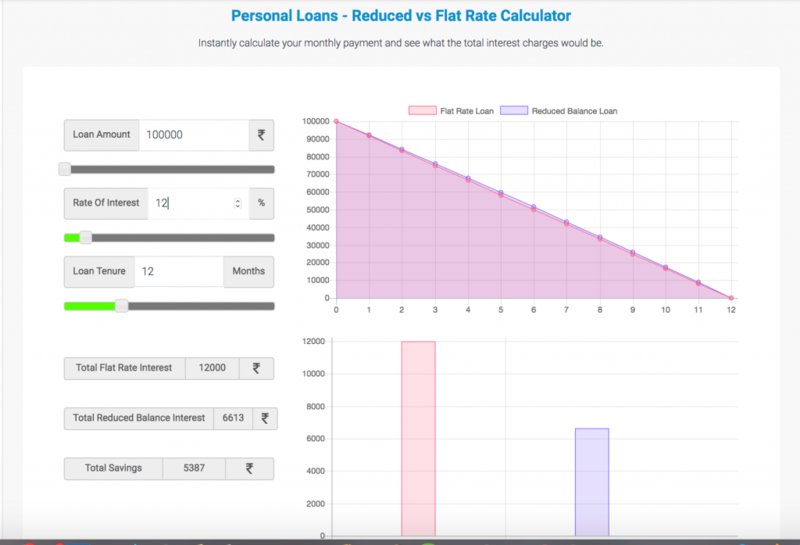 A lot of time the Car and 2 wheeler loans, Personal Loans as well as Consumer Durable loans calculate your EMI at a Flat Rate and is hence much costlier than a Reducing Balance loan. So, next time your are offered a loan, do ask what type of loan it is – Flat Rate or Reducing Balance to understand the real cost better. Hope this help! FundsTiger is a FinTech company based out of Bangalore that offers connects Lenders and Borrowers for Business and Retail loans via its Lending Marketplace. FundsTiger’s vision is Democratization of Finance and we also help borrowers understand the financial implications of the various choices that they have so that they can decide and choose what’ s really best for them.